"That resolution will not pass the Senate, and you can take that back to whoever sent you here," she says, citing that the deal doesn't have a single Republican in favor of the proposal and "the key to good legislation is to tailor something that you write so that it can pass, and you can get a step ahead." "We had a spirited discussion and I presented the group with my draft resolution that provides specific responses to the climate change crisis, which I plan to introduce soon." When Feinstein tries to conclude the meeting, a woman says the children "have decades of life that they hope to still have, and your leadership is so beautifully, beautifully possible," the senator replies, "That doesn't work with me, thank you." 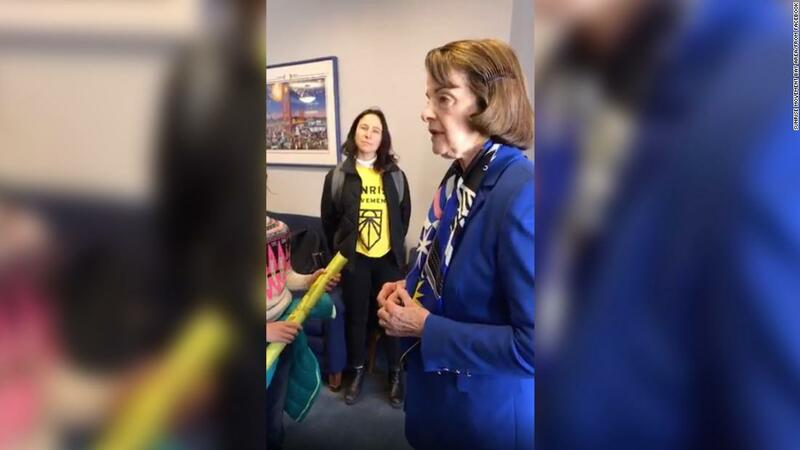 Sen. Dianne Feinstein clashed Friday with a group of children over climate change policy, criticizing their requests that she back the Green New Deal, accusing them of presenting an ultimatum and contrasting their inability to vote with her three decades in office.